1) That is some wonderful small-space living. Note that in one room is their kitchen (see the counter on the left? ), dining room (see the hanging pendant back-left?) and living room (the TV is on the right out of view). 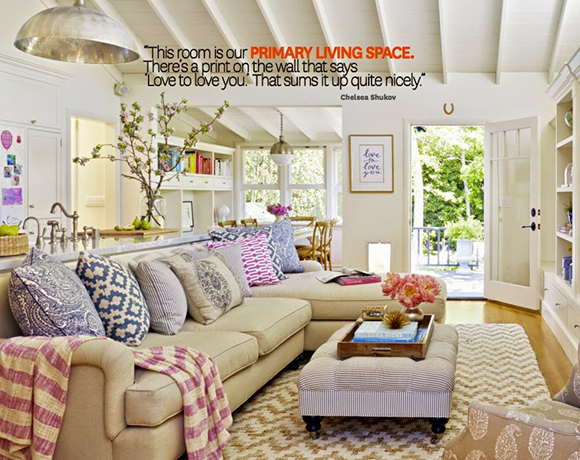 2) White walls - they completely open up the space and keep it airy. 3) The anchor of neutrals is really working for me. If you take away the accents, you're left with all the foundational elements being shades of beige and khaki which I really like with the white walls. I especially love that rug. 4) That ceiling is amazing. High and architectural. If it were my space, I might leave the beams stained and not painted white for some contrast. That might look awesome, yes? But let's be clear I love the all-white look too. 5) The accent color palette of lavender and blues make the space, methinks. Especially with the khaki ground, those colors are really working for me. Yes Daniela, a wonderful family room and the ceiling is remarkable. The pillow power going on is impressive and artful as well.